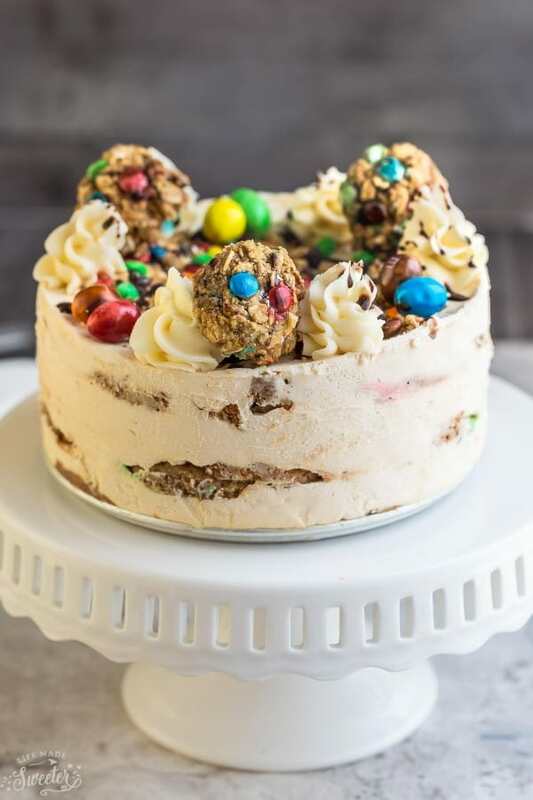 No Bake Monster Cookie Icebox Cake – the perfect fun three-layer dessert based off the popular Monster Cookies. 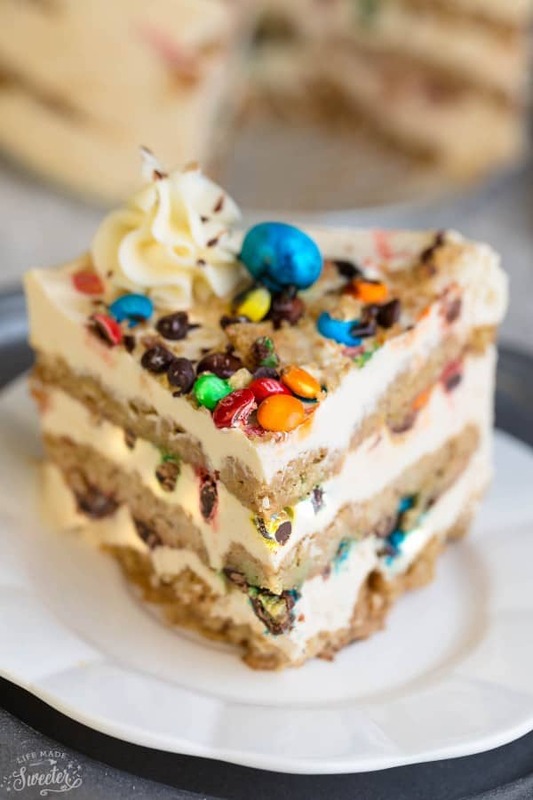 Best of all, so easy to make with layers of oatmeal cookies, peanut butter cheesecake and M&M’s in every bite! Plus recipe video. 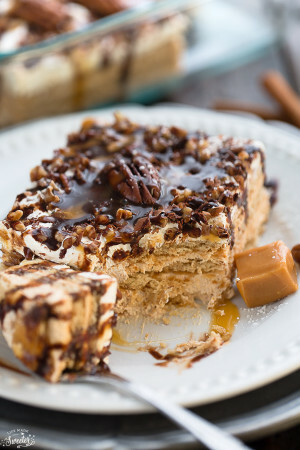 Once the weather starts to warm up, icebox cakes are one of my very favorite desserts to make. They are super simple to whip up, and you can pretty much customize them with whatever cookies or flavors you like. 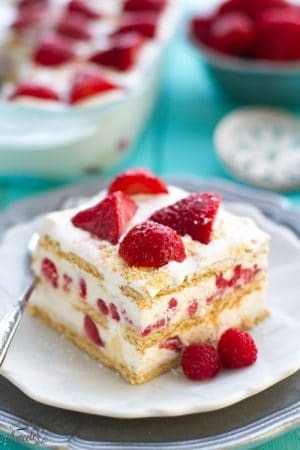 One of my most popular summer desserts is this Strawberry Cheesecake Icebox Cake and in the past few months, I’ve been working on a few other variations. 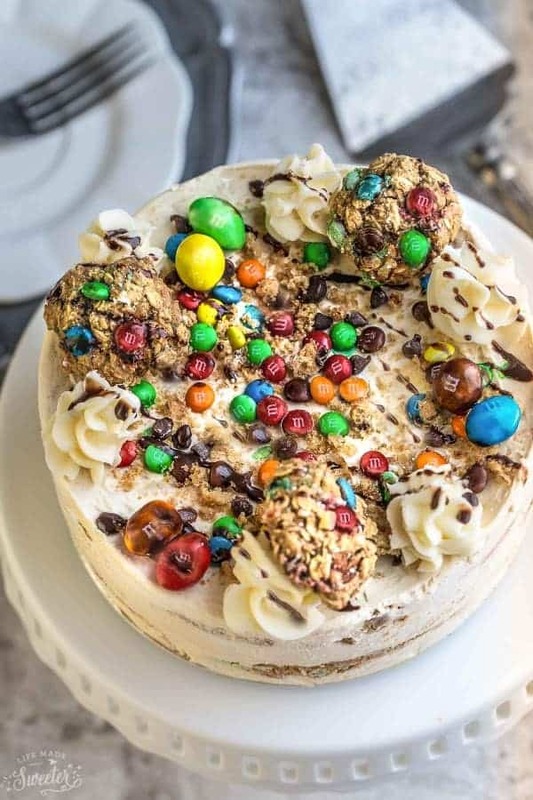 I first shared a glimpse of this Monster Cookie Icebox Cake I had made last month along over on Snapchat over a week ago and already had a few people asking me for the recipe. Oatmeal cookies of any kind are my absolute favorite so I knew I just had to incorporate them into these popular no-bake desserts. 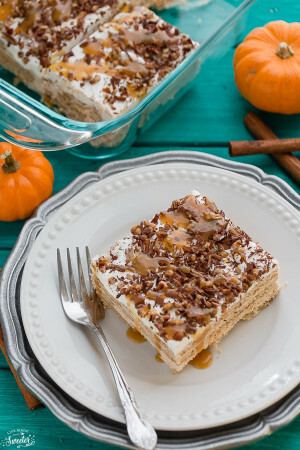 This icebox cake is a fun and easy project that you can make with the kiddos and the best part is that you only really need 10 minutes of prep time with just 6 ingredients. thin and crispy oatmeal cookies (I used a generic store brand) The soft and chewy oatmeal cookies (like Pepperidge Farms or Mrs. Fields) won’t hold up as well once you cut into the cake. cream cheese and peanut butter along with some sweetened whipped cream to give it that airy lightness. a combination of mini M&M’s and mini chocolate chips get sprinkled in between. Repeat the layers then garnish with some more M&M’s, powdered sugar and chocolate sauce. The hardest part is just waiting for everything to firm up in the fridge. It’s the perfect dessert to make ahead the night before if you have a summer barbecue or potluck the next day. Cool, creamy and so much fun! 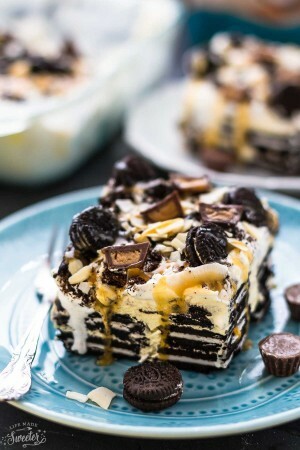 Monster Cookie Icebox Cake - an easy, no bake dessert based off the popular Monster Cookies. 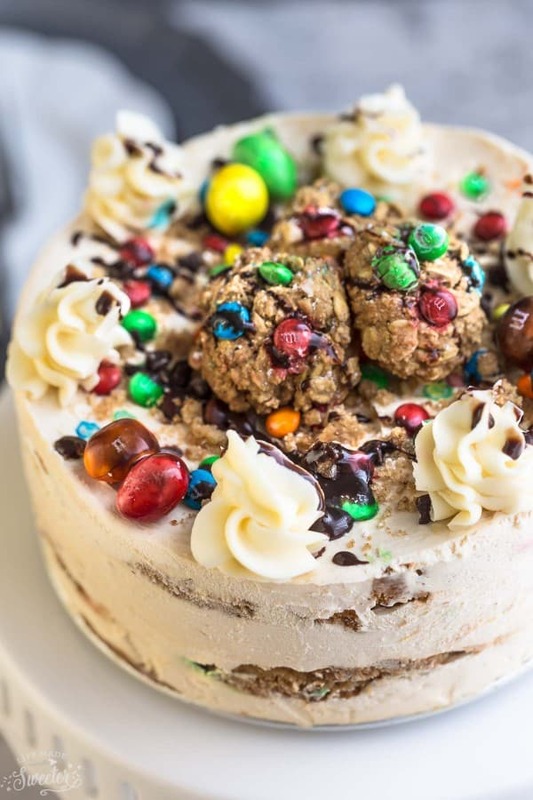 Layers of oatmeal cookies, peanut butter cheesecake and M&M's chocolate candies in every bite! **To make the freshly whipped cream, beat 1 1/4 cups cold heavy cream with 1/4 cup powdered sugar until stiff peaks form. Set aside. In the bowl of a stand mixer or using a handmixer, combine the cream cheese and peanut butter until creamy. Add freshly whipped cream or Cool Whip and beat until smooth. Arrange oatmeal cookies evenly in the bottom of a 6 inch or 8 inch springform pan covering as much of the bottom as possible. Break up a cookie or two to fill in any gaps (it's okay if it's not perfect). Spread 1/3 of the peanut butter cream cheese layer evenly over the cookies and top with 2 tablespoons of M&M's and chocolate chips. Repeat layers two more times ending with the cream layer, smoothing out evenly. Garnish with more M&M's, chocolate chips and oatmeal cookie crumbs. Cover and refrigerate for 5-6 hours or overnight until the oatmeal cookies have softened. Pipe a few rosettes with reserved cheesecake mixture, then drizzle with chocolate sauce and add a sprinkle of powdered sugar, if desired. Serve chilled. *Thin hard oatmeal cookies work best (I used a generic store brand) but feel free to use your favorite brand. Avoid the soft and chewy brands like Pepperidge Farms or Mrs. Fields, as they might not hold up as well.